All Claro series sound cards including the Halo and Halo XT support PCM (2ch digital) input monitoring. The Claro series drivers support the "high quality path" feature. 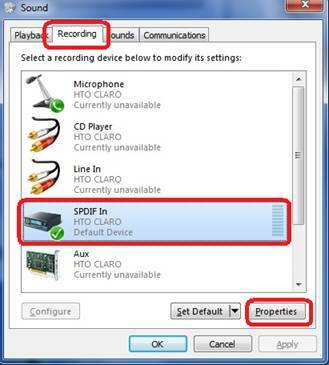 The S/PDIF input signal bypasses the Windows Kernel Mix when using digital input monitoring. Therefore the software mixer volume control is no longer applicable. This is a necessary feature for high quality audio. The audio stream from the digital input will pass-through to the sound card DAC directly in its original state without artificial effects. 1. Select S/PDIF in. Do not select the monitoring button. 2. Control Panel > Hardware and Sound > Sound > Recording tab. 3. 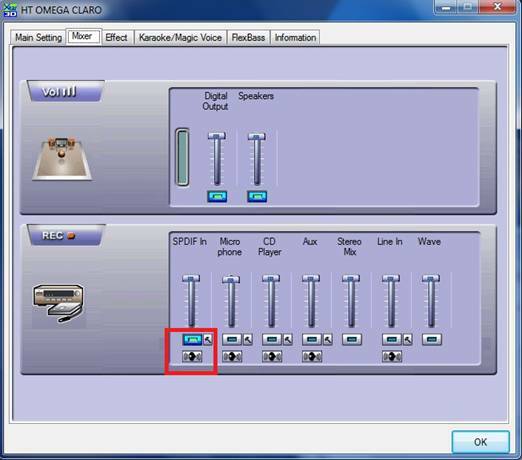 Verify that the "Listen to this device" is selected and Playback device is set to "Speakers (HTO CLARO)." The S/PDIF input signal can now be adjusted through the "Speakers" mixer or S/PDIF input mixer.